From the time I was small, I was told by people that I had a way with words. My mother in particular often said that I should be a writer. During my school days, teachers and professors confirmed mom’s assessment. When I turned in compositions and essays, I often received an “A” on what was essentially a first draft. Sadly, rather than recognizing that I was wasting the opportunity to nurture and refine my talent, I was secretly delighted that I could get away with so little effort. I loved to read, and thought that being a writer sounded like a wonderful dream. When I read Little Women, I truly related to Jo March and her ambitions to be a published writer, yet I was troubled by something I had a difficult time admitting even to myself: I didn’t feel that I had anything important to say. The books I had read, at least the good ones, all taught me significant, memorable truths. If I was going to write, I wanted to deliver fresh insight into the world. Alas, some 6,000 years of civilization have robbed me of that opportunity. I fear that few of this generation will come up with anything that hasn’t been thought of before. Despite the encouragement of my mother and teachers, I did very little writing for several decades. I’ve kept a journal from time to time, but it was the advent of the internet that began to draw me out of that self-imposed writing winter. I began to venture speaking my opinion here and there in forums and newsgroups and re-discovered the depths of my mind. In the process, I realized that time had changed me in a fundamental way. I did have important things to say. So I wrote a book. It was not a JAFF novel, but the enjoyment I experienced watching the 1995 Pride and Prejudice series on DVD inspired me first to read Austen’s novels for the first time and then to write. It was while I was writing my first book that I realized that writing for the sheer joy of it was a radically different experience than fulfilling an assignment. I loved the way writing made me feel–exhilarated, joyful and alive. I edited and re-edited and edited my book again. I printed off 25 copies and dispersed them to various readers for feedback. It was at this point that I got stuck. In spite of generally positive responses, I was incredibly uncomfortable, feeling exposed and vulnerable. I abandoned the project before sending off a single query letter. In October of 2010, the company I work for was in peril due to the weak economy. I was cut back from full-time to just ten hours a week. Unable to afford books, I soon found the Pride and Prejudice category on FanFiction.net for reading and began to consider posting there. It seemed perfect – an obscure little corner of the internet where I could practice my writing in a cocoon of lovely anonymity. I especially loved the idea that if anyone stumbled on and then bothered to read what I was writing, they might comment, and I could get some feedback to help me improve. It seemed perfect. I wrote One Thread Pulled with joy-filled abandon, with no expectations that it would lead anywhere, or that more than a handful of Fan Fiction readers would even see it. I won’t go into all the details of that journey today, but eventually, I started getting requests from the readers at FF.Net and DarcyandLizzy.com to publish it. They wished to have a personal copy of the story. I was flattered and wanted to accommodate these strangers who had enthusiastically supported my efforts, but I had no idea how to go about it. The generous encouragement of one person in particular—our own Austen Author, Brenda Webb—convinced me that I could do it. With additional help from other friends, I did. The first time you hold a tangible copy of your book is an experience you never forget. I honestly had no expectations regarding sales, since I published it more by request than ambition, although I was euphoric to be able to send my mother a printed copy. 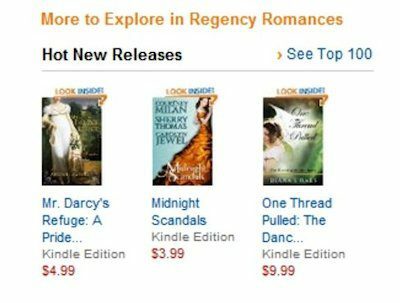 I had no idea that the demand for JAFF was significant, so you can imagine my surprise when the book began climbing the charts at Amazon. Then the reviews started coming in. The emotional impact of the reviews was surprising. Despite the enthusiasm of the positive ones, it was the reviews that were lackluster that forced me to acknowledge that for the sequel, I needed to up my game. I engaged beta readers, subscribed to writing blogs, joined a women’s writing association and began attending writing retreats and conferences where I’ve taken workshops from bestselling authors in many genres. I can now tell you a hundred things I did wrong in my first book, but I also understand what I got right. I’m closing in now on finishing the sequel. Although writing Constant as the Sun is taking longer than I had initially predicted, the work I’ve put into “learning the craft” is shining through in tangible ways. For your enjoyment, I’ve included a short excerpt below. “And what of my niece?” Mrs Gardiner teased. “Your niece was astonished to discover herself quite serene in the face of such splendour. I admit, there was a moment when I felt myself almost shrink under the scrutiny of a rather imperious duchess, but I looked up at Mr Darcy in that instant, and the warmth in his eyes calmed me, and the swelling in my breast restored my resolve. From that moment forward, nothing could intimidate me, and I enjoyed the event very much indeed.” Elizabeth turned her attention to her cup, sipping cautiously on the barely-cooled tea. ← Austen Authors Summer Giveaway ~ Prizes Up for Grabs! Ditto to all the comments about enjoying your first book and looking forward to the sequel. I will re-read the first when the next is released so it all blends together. Aunt Gardiner’s words are true..contempt will show through. Thank you Sheila. I was thinking about this concept in the context of our current social, cultural and political climate. We’re certainly seeing a lot of contempt showing through in society these days, especially via social media, and it saddens me. Civility may not mask disdain for long, but at least it helps people check their tempers! Yes, and in road rage and drive-by shooting – locally two people gunned down by drive-by with no reason. Then there are “mean girls” even from my generation, and cyper-bullies with suicides occurring by victims of such. And twitter destroying reputations in seconds! I enjoyed your evolution into writing. We all have regrets for not following advice when we were young, but we keep moving forward. I loved One Thread Pulled and am eagerly looking forward to the release of Constant as the Sun. Thank you Deborah. I am too! I loved “One Thread Pulled,” as I was one of those who enjoyed it as it was being posted. I died when there was a hiatus between chapters! What happened to that original book? The first one I wrote? It’s tucked away in a folder on my hard drive, waiting for me to decide what to do with it. It wouldn’t take much at this point for me to polish it up and set it free. I’ve been watching your progress on another site — can’t wait to read the final Constant as the Sun! You’ll be happy to hear that I’m nearly done with the next chapter. It’s a doozie! Congratulations! I enjoyed reading about how you got your start as a writer. What would we do without “Little Women”? Good luck finishing “Constant as the Sun”. Thank you! My great-grandmother actually went by the name of “Marmee”, based on “Little Women”, and I had a Jo March Madame Alexander doll that was much loved. As a girl, Jo was my imaginary secret identity! I’m sure that there are many girls who feel the same way. Looking forward to reading Constant as the Sun, Diana. I’m glad. I’m looking forward to being able to release it. Wonderful news! I keep adding to my list of books I have to read as soon as I am able. I loved To Refine Like Silver so I can’t wait to see what you have in store for us. I loved Jeanna Ellsworth’s “To Refine Like Silver” too. It was unique! Stay tuned – I’ll be letting everyone know when I’m done with “Constant as the Sun.” Thanks for commenting! What a great story of persistence, talent, and patience being rewarded, Diana–major kudos to you! Congratulations on being near the end! LOL – I think being near the end is harder than being at the start. I am tempted to take a week off work, rent a cabin in the middle of nowhere and just pound the rest out. Then I think back to that movie “Secret Window” where Johnny Depp is a writer in a cabin and is terrorized by a crazy person and I think twice about the secluded cabin idea. 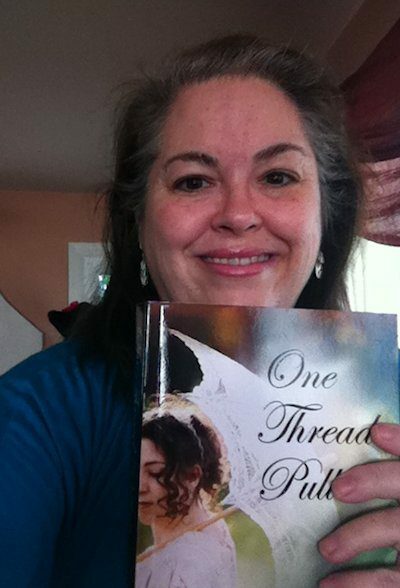 I enjoyed reading “One Thread Pulled” and really look forward to reading the sequel. Thanks for sharing the excerpt! Thank you, Maureen. If you’re looking forward to it, just imagine my anticipation! I’m so happy to be closing in on its completion. I’m glad you enjoyed the excerpt. One of the first P & P variations I read was, “One Thread Pulled” and I loved it. Since then I have gone over reading 200 of them and love them. Looking forward to a great adventure reading your next novel, “Constant As The Sun.” Thank you and I am glad you followed you mother’s advise and then followed your heart. Thank you, MaryAnn. I myself lost count of how many JAFF novels and stories I’ve read now, but I love them too. I have at least a dozen I haven’t had a chance to read yet on my Kindle, and at least a dozen more on my bookshelf. I never want for something to read these days. I only want for time to both read and write. Really looking forward to “Constant as the Sun”. You are a gifted writer and a deep thinker. I appreciate your insights, as they make me look beneath the surface, too. The human condition is always interesting – no matter how many centuries of writers have penned stories. Thank you so much. I don’t believe that many people realize how deeply I think on a subject before I write something that may not seem the least bit deep, so it is gratifying to have someone recognize that aspect of my writing. Your comment truly touched me. I’m glad you enjoyed the excerpt, Joana. As is seen here, I have assigned Mrs Gardiner the role often played by the chorus in Greek drama, that of making commentary to point out what is happening and also as Elizabeth’s mentor, which is, of course, where Jane Austen put her too. If there is something Elizabeth needs to think about, you can often expect Mrs Gardiner to say something. isn’t it wonderful when something you love so very much is loved in tandem by the (majority) of people that see it? I enjoyed the first one and will keep my eye out for the second! Thanks for sharing your journey! The journey I detailed in my post, (at least from the day I discovered JAFF) has been laden with serendipity at every bend in the road. It is wonderful indeed. I have been eagerly awaiting this book since I finished One Thread Pulled! Now I will have the pleasure of rereading it just before beginning Constant as the Sun! The happy thing about “Constant as the Sun” is that it ties up so many of the parts of “One Thread Pulled” that weren’t completely resolved. A re-read of the first will certainly refresh your memory on what all those loose ends are. Thanks for the comment! I am so proud to have played a small part in your success Diana. From the first, I found your ‘way with words’ entertaining and I knew you would be a success if you were published. And you have been! I smile every time I notice that your book is still in the top sellers. Personally, I think books that are still selling years after they are published are the mark of a good writer and that is certainly true about you! I am waiting patiently until you finish your current story so I can read it all at once. I find I hardly have the time to read on my own forum anymore (too many things to maintain while I am on there) but I do love to get the published book, carve out a few hours and read all I want! I loved the excerpt and can’t wait to read the rest. You have the patience of a saint, Brenda. As you know, the past few years of my life have been filled with upheaval, some parts good, some not, but everything combined has resulted in significant delays to my planned schedule on the sequel. That part has been frustrating, but I’m still at my happiest when I’m writing. I’m pleased to learn that your close to finishing. Actually, you’re probably happy about it, too! 🙂 I’ve been looking forward to reading it for a while, so I’m glad that it will be soon. Good luck with the process. Ugh, can’t believe I did that! I meant “you’re”! Sorry about that. LOL – we all have the occasional typo, Ginna. No apology necessary. And you’re right – I am so thrilled to be getting close to finishing it. I’ve done a lot of editing along the way, so I’m hoping the edits won’t be too painful or lengthy, as I’m anxious to give birth to it! Thanks for this inspiring and wonderful post. I’m so glad you enjoyed it. Thanks for taking the time to leave a comment. Have a wonderful week! thanks for the excerpt and the article. I have One Thread Pulled and look forward to Constant as the Sun. Lucky you decided to use your childhood talent AND discovered a fondness for P&P as these are my favourite types of book. I love reading about how authors become authors. Those moments of “Oh, me, too!” create such lovely connections between strangers who become less foreign in the process, and parts of your story sound very familiar to me…especially that part about getting an A with little effort! Thank you for sharing! LOL – I left out the part about some of my college roommates resenting me while I, quite naively couldn’t figure out why they thought it was so hard. Of course, I paid the price for it with math. Math IS hard. Hello Diana! Thank you for sharing your journey with us! Thank you for sharing with us this excerpt, I cannot wait to read this sequel!! You are welcome. I’m glad you enjoyed it! Thank you, Jen. You’ve always been so encouraging. It’s a blessing to know there are people out there like you. Diana, How lovely that you received such wonderful encouragement as a child. It is surely the greatest gift a parent or a mentor can give a child. It is so true, Barbara, and that’s why I dedicated “One Thread Pulled” to my mother. Ah, Charlene – you hold a dear place in my heart – you reviewed “One Thread Pulled” on Goodreads before I even had a profile there. As I writer, I appreciate supportive readers like you!